Click Options > Indentation... to specify how XMLBlueprint should indent your documents. • Use the radio buttons to specify whether XMLBlueprint should use Spaces for indentation or Tabs. • Use the check boxes to specify when the indentation will be invoked. The preview shows how your settings will appear in the XML Editor. • when the TAB key is pressed. • when the document is formatted (XML > Format Document). • when the document is automatically formatted when it is opened. • when one or more lines are indented (Edit > Increase Indent) or unindented (Edit > Decrease Indent). Check Detect indent when a document is opened to use the indentation of the document you are opening in stead of the indentation as specified in this dialog. 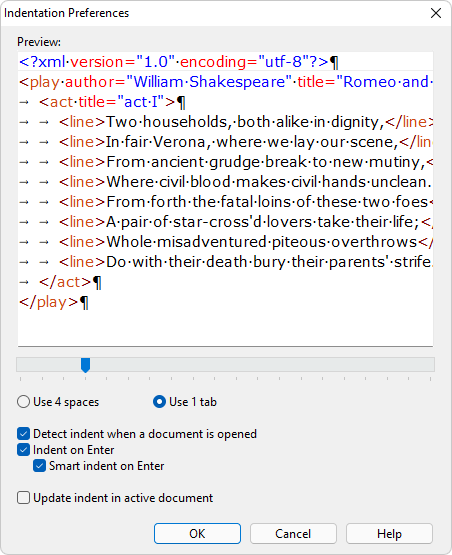 This way you can edit someone else's documents without changing the document's indentation.